Gaylord Entertainment and Dolly Parton’s Dollywood Company are entering a 50/50 joint venture to develop a 114-acre family entertainment zone adjacent to the Gaylord Opryland Resort & Convention Center. The Dollywood Company will serve as the operating partner of the as-yet-unnamed outfit. Phase one of the project is an approximately $50 million water and snow park, the first of its kind in the United States. A late 2012/early 2013 groundbreaking date is expected, with the park opening slated for summer 2014. Tennessee Gov. Bill Haslam and Nashville Mayor Karl Dean joined Parton and Gaylord Entertainment Chairman and CEO Colin V. Reed at today’s announcement at the Grand Ole Opry House at Gaylord Opryland. The water and snow park will anchor the project which will include 35-acres set aside for future expansion. The park will provide a mix of high energy water activities for the summer season and designated snow activities for winter play. Once open, first year attendance is projected at 500,000, a large portion of which will come from out of state, bringing in substantial tourism revenue to Tennessee and Nashville. Dollywood expects to employ 450 full- and part-time employees. 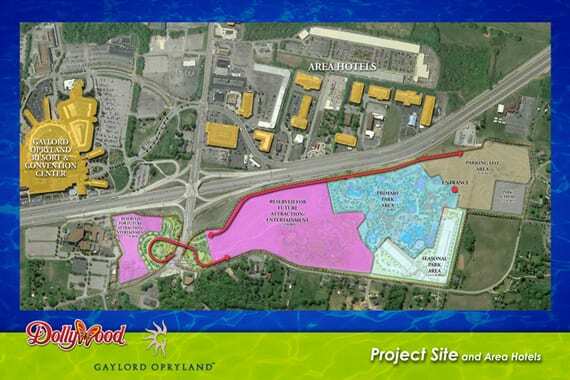 This proposed attraction furthers Gaylord’s focus on growing the leisure side of its business.